Price ($50) includes Field Trip Guidebook and Lunch (sack lunch and bottled water). Depending on the group size, it may be necessary to rent vans in order to reduce the number of carivan vehicles at field stops. An additoinal fee to cover these costs will be evaluated once we have an idea of how many participants will be on the trip. Date/Time: Saturday, 2 May / 7:30 a.m. – 5:00 p.m.
Level of Difficulty: Most stops along the field trip route will be short and close to the vehicles. However, there will be one short rock scramble along Oak Creek. Comfortable, supportive footwear is recommended. Check weather forecast in advance and dress accordingly; it is spring and we will be at a relatively high elevation (3,800 to 7,000 feet). Guidebook and Lunch Costs: $50 (members and guests), Student members are free. Field trip guidebooks will be provided to trip participants. Additional guidebooks will be produced by the AGS following the trip, which can be purchased at our dinner meetings. A sack lunch and bottled water will be provided. Participants should bring snacks and other beverages to suit their needs. Car Pooling Arrangements: Carpooling is strongly encouraged to reduce travel costs and number of cars at each stop for safety and logistical reasons. Participants names/contact information will be circulated to registered attendees for participants to make arrangements, as needed. Additional Transportation Costs: Rental vans may be required depending on the group size and need to reduce the number of caravan vehicles at field trip stops. An additional fee to cover these costs will be evaluated once trip registration begins. Motel Accommodations: Participants will be responsible for their own motel accommodations. For more information about motels and prices visit the AGS Spring Field Trip Flyer. Mike Conway has tentatively reserved nine rooms (2 king size beds, for two nights - 1 and 2 May for $75/night) at the Travel Lodge Flagstaff University West. Contact Mike Conway if you want one of these rooms. Tour Description: Paul Lindberg has graciously agreed to lead an AGS field trip to the Oak Creek – Mormon Lake area south of Flagstaff. The May 2, 2015 field trip will examine the Oak Creek-Mormon Lake Graben by circumnavigating key locations around its perimeter. The age of the new graben cutting into the Colorado Plateau is estimated to be only 2-3 million years old and its subsidence may be contemporaneous with the start of the eruption cycle of the San Francisco Peaks. 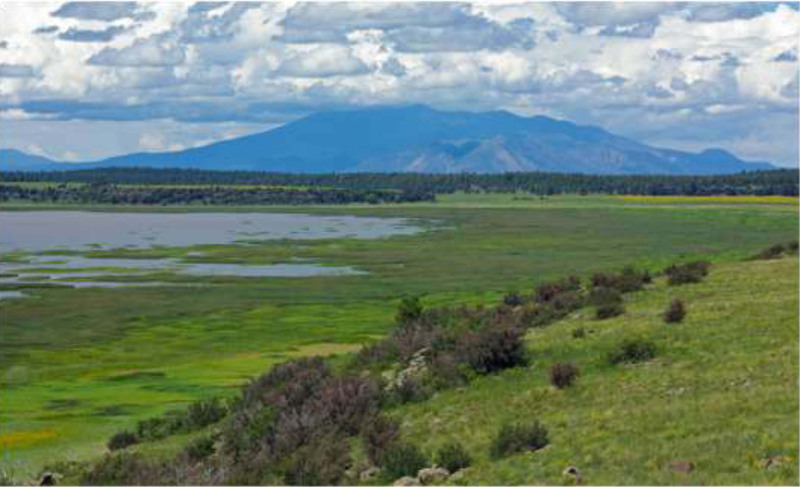 Flagstaff lies within the northern end of the graben and the I-17 freeway corridor extends south toward Camp Verde, where the rift valley merges into the older Verde Graben that is estimated to be ~10 million years old. As such, Interstate 17 traverses from Flagstaff to Camp Verde entirely on the surface of Miocene basalt lava flows with no Paleozoic Mogollon Rim sedimentary rocks exposed along its length. Mogollon Rim exposures lie to the west and east of the young graben. For a detailed description of the geology of Oak Creek and the nearby Mormon Mountain Graben see Paul Lindberg’s 31-page paper in the Oak Creek Watershed book, which is available at the AZGS’s Arizona Experience Store. There may be an opportunity for an informal tour of the San Francisco volcanic field on Sunday, 3 May. We’ll circulate information as it becomes available. Contact: Arizona Geological Society President, Mike Conway at michael.conway@azgs.az.gov or (520) 209-4146 if you have any additional questions.